Your feet bear the brunt of your daily activities, especially as you get busy with your wedding preparations. In fact, you never realise how tired your feet are until you lie down in bed at night. Tired feet can cause many problems. Your body posture is affected if you have aching feet. Also, if your feet begin to crack, there is a higher chance of bacterial and fungal infections such as ringworm developing in them. Point is that your feet need cleaning and pampering. If you have been putting off the luxurious salon pedicure, then here are some great ways to enjoy a foot spa treatment right at home. These easy to follow, cost effective tips make your feet soft and relaxed. The few important foot spa regimes include: preparing, cleaning, exfoliating, massaging and polish. First and foremost step of a foot spa is to remove the nail polish. It is best to use an acetone free nail polish remover as acetone can leave your feet dry. Also, before you begin with the cleansing process, do cut the long nails as this would help you clean them better. Once you cut your nails, do apply a cuticle cream to soften them. Then push back the cuticles with the cuticle pusher very gently. Now, soak your feet in a tub of lukewarm water. Add a pinch of salt in it. It will help to remove dirt and dead skin. The salt will also help you to get rid of swelling. After that, add shampoo in the water and rev up the lather. Let your feet soak for twenty minutes. Remove when the water temperature comes down to warm. Clean your feet thoroughly using a soft brush. Brush at the heels, between the toes and on the sole. Use pedicure tools to clean the dirt under the toenails and gently scrap off the dead skin surrounding the nail. You can also add a few drops of peppermint essential oil or lemon essential oil in the water if your feet feel tired. Almond extracts and milk will also help in making your feet extremely soft. You can add a teaspoon of hydrogen peroxide as well, which will extract the hidden dirt from the little cracks in the skin. You can use the exfoliation scrubs and gels available in the market. Exfoliation can be done with a foot scraper or a pumice stone. Rub it on your heels because that is where most of the dead skin ends up accumulating. Do not ignore the pads under your toes. Exfoliate every part of your feet. Once done, lower your feet in the water. Then wash your feet gently. Remove your feet from the water and using a clean towel to pat your feet dry. If you don't have a foot scrubbing gel, then you can use your regular facial scrub or body scrub as well to exfoliate your feet. Massaging is best done with an unscented skin nourishing cream. The best home remedy is to massage with foot cream mixed with a few drops of lemon juice. Lemon juice will help you get rid of dead skin and will also to remove tanning from the feet. You can also rub a slice of lemon on your feet before you move towards massaging them with a cream. Now, massage the cream on to your leg, applying just the right amount of pressure. Knead the soles of your feet for complete relaxation. 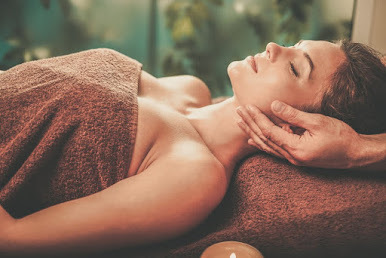 A 10 minute massage gets you the most beneficial results. Moisturising is important because the warm water can leave your feet dry and cleansing would leave your skin pores open and exposed. You can also use some essential oil, such as lavender, olive or almond, or your normal body lotion for the massage. Since your nails are soft right now, first file them properly. Next, most important step to finish your at-home foot spa treatment is to apply nail polish. However, you should wait for a day before applying the polish. 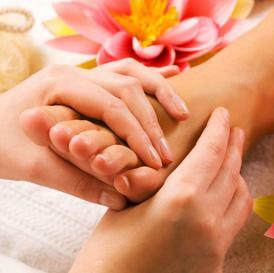 Since foot spa rejuvenates your feet, your nails breathe better. Applying polish might block this breathing process. Pamper your feet once a week and love the feel of your soft feet. A revitalising foot spa will also help rejuvenate your mood. Thanks to you for giving the tips on Rejuvenating Foot Spa at home. Actually, i needed to know the tips for making good Rejuvenating Foot Spa at my home. I like to do spa service at my home. So, it is need to me as well. Your tips about Rejuvenating Foot Spa at home are wonderful. I consistently read your site and it’s exceptionally supportive. Definetely massage one of the best therapies for feet. Thanks for sharing such great information!